Marble Arch Inn has a twenty four hour Reception. From the moment you arrive, at any time, our friendly and well trained staff will ensure you are looked after with only the highest level of service. 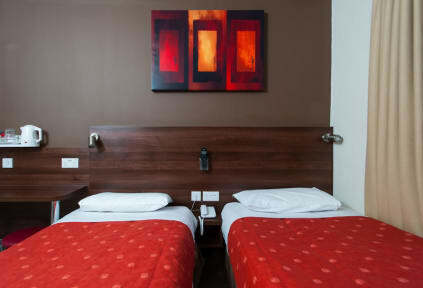 We can accommodate you and your guests comfortably in our well equipped and appointed rooms. All rooms with Remote Control Colour Satellite Television, Direct Dial Telephone, Clock/Radio, Central Heating, Hairdryer, Tea/Coffee Bar, Travel Electrical Adaptor, Wash Basin and Fridge/Freezer. Most rooms with Shower, Toilet and Secondary Air Conditioning. The room was very small and the bed was too short. (I'm 1,75m) it also wasn't a double bed. We nearly fitted next to each other.